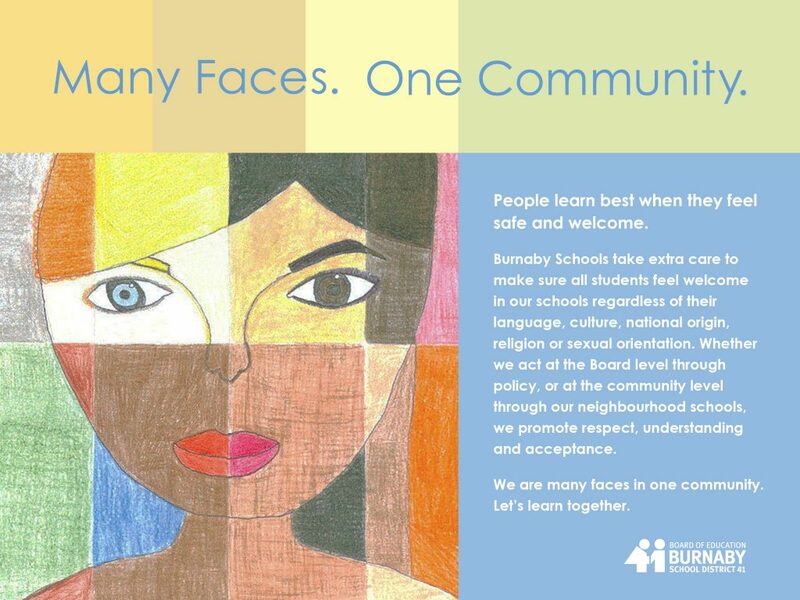 Burnaby Schools celebrate diversity. We are proud to be a leader in creating inclusive, welcoming environments in our schools. We strive to provide engaging learning opportunities to inspire each child to reach their potential. We want all students to flourish and we have policies that support inclusivity. Our Sexual Orientation/Gender Identity policy (SOGI) is one such policy. It has been in place since June 2011. The Burnaby Board of Education built the policy through a collaborative process, including reaching out to the public and other stakeholders for input. It’s our job to ensure Burnaby Schools are friendly and safe learning environments, and the SOGI policy is a part of that. The District follows the curriculum for each grade level provided by the BC Ministry of Education. Students experience lessons that promote tolerance and understanding of the diverse society in which we live, and they learn to treat each other with dignity and respect, regardless of our differences. For additional background and frequently asked questions, click here.